The rocky hills north and east of Phoenix harbor several scenic lakes including Theodore Roosevelt, Bartlett, Canyon and Apache (these last two are beside the Apache Trail), but the most popular is Lake Pleasant, a 7,500 acre reservoir at the edge of the Hieroglyphic Mountains, formed by New Waddell Dam across the Agua Fria River. 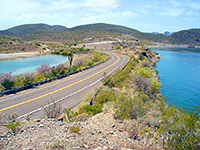 The lake has good facilities and is easily reached, by a drive of 14 miles on main roads from interstate 17, or 35 miles from downtown Phoenix. 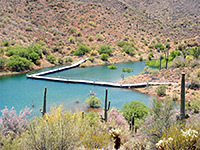 People come here mostly for water-based recreation, principally boating, fishing, swimming, water skiing and jetskiing, though the undeveloped hills enclosing the lake are as good a location as any in the Phoenix area to see the plants and animals of the Sonoran Desert - numerous saguaro, cholla, echinocereus (hedgehog cactus), ferocactus (barrel cactus) and palo verde trees grow on the stony hillsides, which are home to many lizards, snakes and other elusive creatures. There are only three official trails around the lake but cross-country hiking is fairly easy since the spiky desert plants are quite well separated. The lake is part of a regional park (entry $7 per vehicle in 2019); other facilities include a marina, campground, visitor center, boat launch sites and picnic areas. The whole place is clean and well managed; beaches are kept free of litter and the roads are regularly patrolled by rangers. As with other such mountain lakes, the great majority of the shoreline is inaccessible by road though the park has one other entrance at the northeast corner, reached by the 5 mile, unpaved Table Mesa Road from I-17 exit 236, a route which deteriorates to a 4WD track a little way short of the lakeside. Anthem on I-17 is the closest town with lodging; other nearby places are Peoria, Sun City, Surprise and Wickenburg. (see map below) One road (87th Avenue) leads towards the southeast corner of Lake Pleasant, to the privately-operated Pleasant Harbor Marina and the Desert Outdoor Center, a study/events facility open by reservation only. The main entrance route is a few miles further west via the Castle Hot Springs Road, which heads north through the saguaro hills close to the west edge of the lake, becomes unpaved and continues to various remote sites in the Wickenburg and Bradshaw Mountains. Two roads fork off towards the lake; Castle Creek Drive in the north ends at a picnic area and boat launch, but most facilities are reached by the southerly road. This splits into several branches, leading to various campgrounds, picnic sites and day use parking lots. In some places vehicles can drive on the beach right by the water's edge, since the convoluted inlets and promontories mean there are several miles of accessible shoreline, bordered by land that slopes down gently to the water, without any steep cliffs. As a result of the ease of access, the area can become quite busy but a more peaceful experience can be had by visiting the beaches further north along Castle Creek Drive, or by taking the Pipeline Cove Trail which links the two lakeside roads. 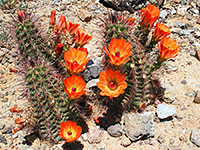 The 0.8 mile Roadrunner Trail traverses a section of the south shore near one of the campsites, and the 1 mile Honeymoon Cove Trail crosses a promontory north of Pleasant Harbor, though this is open only to guests of the Desert Outdoor Center. The best path in the park is the Pipeline Canyon Trail, a 1.8 mile route crossing pristine, undeveloped desert land along the west side of the lake, mostly out of sight of the water apart from in the middle, where it descends to cross a narrow inlet (Pipeline Cove), via a floating metal bridge. The remainder of the trail is alongside dry washes, with minimal elevation change. The bridge is a popular destination as it crosses deep water, good for swimming and diving, though the structure is sometimes removed if the lake level drops. 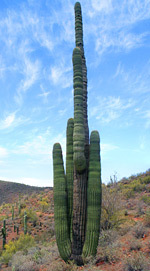 There are several secluded bays nearby, reachable by walking off-trail through the cacti.